English Idioms and Phrases are important for the competitive exams like CDS NDA AFCAT UPSC etc. They come up all the time in different competitive exams in English paper. Having good knowledge of Idioms will help you to score around 10-20 marks in your English question paper for various exams like CDS AFCAT NDA Bank UPSC SSC etc. Idioms don’t always make sense literally, they are different words with different meanings and usage. To understand the Idioms, you’ll need to familiarize yourself with the meaning and usage of each idiom. Learning idioms will be easy and the best way to understand and remember Idioms is by comparing English idioms to the idioms in your own language. 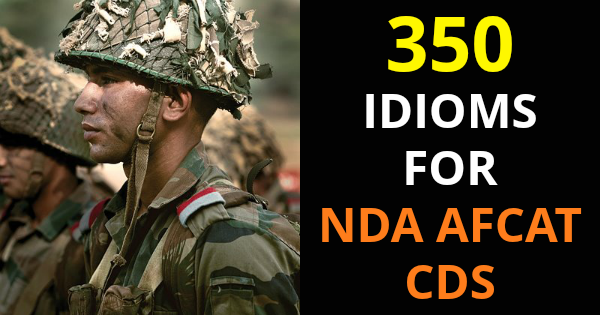 The candidates who are preparing for the NDA AFCAT CDS exam in 2018 – 2019 can read the Useful Idioms & Phrases given below. Reading idioms daily and gaining enough knowledge of Idioms and Phrases will help you to score more marks in your English paper. List of most common English Idioms for the competitive exams. List of common English Idioms and expressions for the competitive exams. List of difficult English Idioms for the competitive exams. Hope you liked the list of Idioms and Phrases in the post, you can go through them daily and learn more about these idioms, not only for your exams, but you can use them in your day to day life.